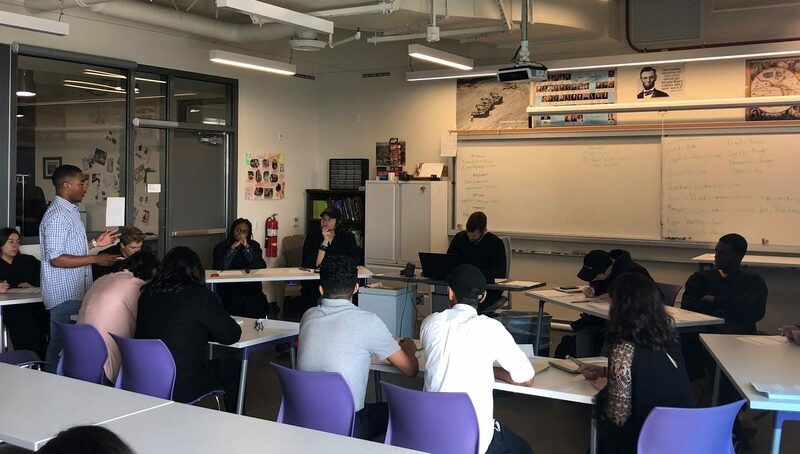 The 12th grade students of Da Vinci Communications recently tackled a project in their government class to argue a case before a panel of nine justices of the U.S. Supreme Court (a collection of students and teachers) and do their best to win their vote. Each group of 2-3 students was randomly assigned a side to a case that resembled real life Supreme Court cases on civil liberties to help students to learn both sides of the argument legally…and to keep them on their toes. Students argued cases on a range of topics, including freedom of the press vs. national security, whether waterboarding is considered torture, freedom of religion vs. freedom from discrimination, and more. When asked about the purpose of the project, DVC’s 12th grade government teacher Robert Allen said, “Aside from the comprehension of the constitution and civil liberties, I wanted students to identify and understand some important constitutional concepts and put them together and apply them to an argument. This promotes a deep level of critical thinking.” The students were asked to be like lawyers in a real court case: they needed to ask for a ruling, refer to the nine Justices as “Your Honor” and speak in a civilized manner using previous court rulings and the Bill of Rights as their main evidence. The project took place over a full month, which involved preparations and the actual court hearing. In order to prep for their case, students were asked to write a Writ of Certiorari, which is a document that informs the Supreme Court of the case and tries to convince the court to hear the case. Next, they were assigned their side of the case and given time to research their argument and how to use the amendments to argue their side. The week before the court hearings, each side wrote a brief for the court, which informs the court of their arguments and precedent cases. Finally, students presented their case in a real debate format, similar to a real Supreme Court hearing. Each debate was around 30 minutes, giving time to hear both arguments, answer questions from Justices, and rebut each other’s arguments. When all the cases had finished, Allen was asked if he thought the project was successful. “There were really really solid cases, the vast majority, and I was very pleased and proud of the students,” he responded.